It's just so unique and beautiful. Honestly the show is quite charming. I'm not really a big fan of TV or Anime. Most are pretty bad, tv and anime alike the shows are blend.. but this is beautiful.. Its on par with stand alone complex 1 and 2 for me. Beautiful in a way few things are. Mushi-Shi is the kind of anime that sticks with you. EVERYTHING, from the animation to the stories to the soundtrack, is amazing. While many anime series depend on fast-paced, loud, and invigorating episodes, Mushi-shi simply doesn't need to. The episodes are all well-paced, all unique, and they each come with a sense of wonder. Each one exemplifies the beauty of the Mushi-shi world, and the creeping fear it inspires in the people that live in it. The soundtrack perfectly eases the watcher into a combination of awe and unsettlement that the animation only helps with. Mushi-Shi is a uniquely serene show, but at the same time, there was not a moment when I wasn't on the edge of my seat watching it. I've rarely seen any show, and almost never an anime, that creates this feeling. I would 100% recommend anyone to watch it, even if they don't usually watch or like anime. Do yourself a major favor, and start watching Mushi-Shi. Few words. Beautiful, Soft, Bold, Thought-provoking, Intimate, Detailed, Lush and Dreamy. Yes, the is by far, one of the best anime's I've ever seen. I loved the pacing, the philosophical plots, the struggles of man and nature and the idea that everything is "alive". Ginko, is one of those narrative characters, who holds your hand through this world, as we visit characters with supernatural experiences. It took some time to really grow on me, but once I sat still and allowed the show to grab me, it wouldn't let go. If you watch this, you're in for a pleasant, yet saddening treat. Although there are recurring background characters, each episode is essentially a stand-alone story that is one part procedural mystery, one part family drama, one part historical fantasy, and one part creeping dread. The proportions of the above vary, but be prepared for the occasional heavy thematic episode or shiver-inducing dose of body horror amidst the fanciful tales of a man who treats what are essentially the mystical cousins to normal bacteria. Occasional shortcuts (people's facial features disappear regularly; motion is often weirdly slow) may detract from the experience, but overall the art is beautiful. Highly recommended for anyone looking for something subtly dark. 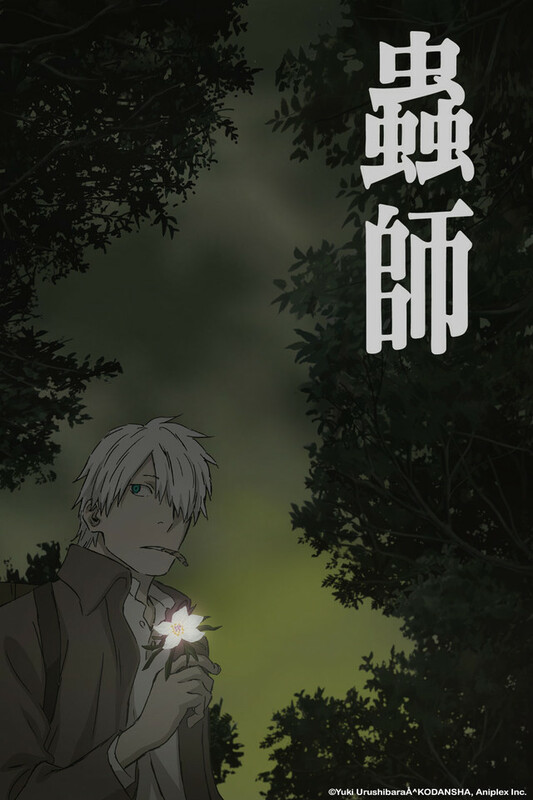 Mushi-Shi is definitely one of the better animes I've seen. It has so many good stories to tell, and it does so beautifully. The animation and music is top notch, which gives the anime a superb atmosphere. It's interesting, deep, well-animated; not one to miss. Give it a watch. A unique 5 star tale of tales. Mushi-Shi is truly an amazing anime. The show is made up of many different stories followed by the main protagonist Genkgo who is a Mushi-shi or mushi master. Mushi are living entities which live in a parallel universe that often come in contact with ours. Though the Mushi aren't evil, they can often cause problems with our plane of existence. Mushi-Shi's are highly knowledgeable about the different kinds of Mushi and help to the best of there abilities. Each tale is unique in there own way and is beautifully drawn. I highly recommend this show to anyone who hasn't seen much anime. It's a fav of mine. I love the design and the atmosphere the show/manga creates. It might be fantasy but it's not the kind that is typically envisioned were magic makes everything more fun or better so it feels very real. It is slow, but in a good way. Best anime I have seen. The art is so beautiful, the story is always interesting, and the mood is unparalleled. Really draws you into the world. Even though the plot of the episodes is not connected, the overarching themes continue throughout the show, as well as the ways you get to know the main character in each story. Great mix of fantasy with folklore and historical Japan. I would say the closes to this anime is Ayakashi Samurai Horror Tales, but that's not quite right, but if you enjoyed that you will likely enjoy this. It's a monster of the week type of anime that strays from virtually all anime tropes. The animation is beautiful, the stories are intriguing, there's mystery and tension. The music is very calming. The stories are not predictable and each is unique. You must give it a shot.